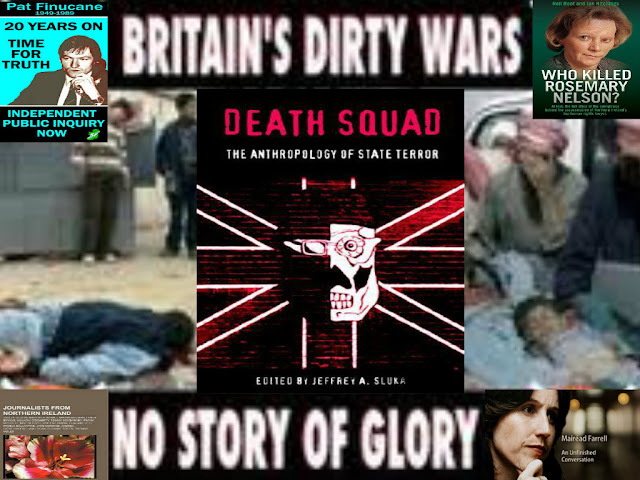 In 2006, it became public knowledge, that Britain's SS(secret services) helped the IRA organize 'human bomb' attacks, in a tactic involving, forcing civilians, to drive car bombs into British army checkpoints with devastating consequence. This was just one of a series, in an evolution of guerrilla warfare techniques, that left many keen observers scratching their heads wondering, who was friend or foe and whose side, several senior British intelligence operatives were on. It came then as no surprise then to many in 1994, when almost all of the UK's senior intelligence experts were wiped out, when a helicopter carrying them crashed at the Mull of Kintyre. These were the elite who had overseen the the dirty war in British Occupied Ireland. For a proper understanding of this, please see a full report below by Finian Cunningham formerly based in Belfast who is Global Research Correspondent on Middle-east and east-Africa affairs. One of Britain's agents, has spoken about MI5 arranging a weapons buying trips to America, where he received critical equipment, used later by the IRA to kill soldiers and British paramilitary police. He also spoke of UK SS co-operating with the FBI, to make sure everything about his visit to the USA went smoothly and that his cover would not be blown. The technology he obtained in the USA was then used in British Occupied Ireland and has since been copied for use in Iraq and Syria today in roadside bombs which have killed numerous British and American soldiers troops. Several IRA leaders at the highest level, were trained as members of Britain's SAS special forces, this training of other groups continues to this day. In 1998, a former US Ambassador to the UK claimed that the Administration of a US President leaked critical British intelligence on British occupied Ireland to the Irish Republican Army. The FRU or Force Research Unit was the name used by a covert military intelligence unit of the Defence in the Intelligence Corps of the British Army whose headquarters were at Templer Barracks, at Ashford in Kent. The FRU was formed in 1980 with its Intelligence Corps centre at Thiepval Barracks, British Occupied Ireland, from where it recruited and handled its agents. The FRU engaged in collusion with paramilitaries and contributed to the assassinations of numerous civilians, human rights lawyers, journalists, British soldiers and police in British Occupied Ireland despite a Peace Process. In 2007 the FRU changed its name to the Joint Support Group (JSG) and has been active in Iraq and Syria. JSG agents are trained to turn civilians into coalition spies and state terrorists using methods developed in British Occupied Ireland. Since the election of the Tory Government, the Irish Peace Process is being systematically dismantled, to enable a return to using British Occupied Ireland for further research, using Kitsonian counterinsurgency theories, equipment and the development of further State terrorism techniques. Techniques around internment, torture experiments, water boarding with the famous "14 hooded men" were all passed on to the Americans by the British and used in places like Abu Graib and Bagram. The British seek out "society's psychos" and train them in using these activities. After the invasion of Iraq in 2003, subsequently in Libya and recently in Syria, the British have been responsible for running hundreds of double agents throughout the Middle-east and in 2003, the former head of the FRU in Ireland throughout the Troubles, Brigadier Gordon Kerr, was sent to the Gulf to head up British activities in the Middle East becoming head of the JSG there. Today Britain are continues to use the same techniques in Syria, as they did in Libya and Iraq, which they developed during the troubles in Ireland. By re-activating internment without trial, the spark that started forty years of war last time in Ireland, and interning old, iconic, respected Irish republicans in a flagrantly illegal way, without trial, charge or sentence, despite directives from several judges for their release, the British are banking on continuing with their experiments of countering the insurgency they are provoking. "For 17 years the British authorities have lied about the fatal RAF helicopter crash on the Mull of Kintyre in which 25 senior counterinsurgency personnel were killed. Now Global Research reveals new evidence showing that the loss of life was an intentional act of sabotage. But a private investigation into the circumstances of the crash has now revealed exclusively to Global Research that the official account is seriously flawed. Disturbingly, there are sound reasons and evidence to indicate that the Chinook was brought down deliberately with the intention of wiping out the counterinsurgency team. And, as we will see, there is a technical “smoking gun” for how this could have been achieved. British aviation expert Walter Kennedy, who has spent the most part of 17 years independently assessing the incident, said: “All official inquiries have totally misrepresented what happened. There have been so many lies, misrepresentations and obfuscations. Anyone with an avionics background who looks into this will see that the official account is seriously flawed. “Do I think the Chinook was sabotaged? Absolutely,” added Kennedy, who for 30 years was a member of the Royal Navigation Institute and spent nine years working as a systems engineer in Britain’s military industry and 25 years on navigation systems in civilian aviation. Kennedy’s investigation into the Chinook crash is based on flight data disclosed, but not followed up, by the official inquiries, and from inspecting the crash site where he interviewed local people. He has also pieced together sensitive information obtained from various RAF sources . What he has found is stunning. “If you work through the flight data each aspect is like a jigsaw puzzle and from the picture that it forms it is obvious that the official story is false. It is fascinating that none of the official inquiries probed the obvious questions that arise from the known flight records. The official line seems to be determined to stick to an account that is demonstrably not supported by the data. The official narrative conveyed in the media continually emphasises extreme weather as being a primary crash factor. This, Kennedy says, is an appalling misrepresentation of the actual conditions prevailing at the time of the crash. Local sources told Kennedy that the conditions on the evening of the crash were typical for that time of day and year. Fog and poor visibility are features to be sure, but the weather is predictable. Also, the fog and cloud are generated from the landmass. Typically, the terrain overlooking the Mull was shrouded in a thin ground-hugging mist on the lower slopes whereas ground above 800 feet was covered in a dense orographic cloud. Offshore, the sea was typically not covered in fog. While the ground detail of the landmass would have been obscured by the mist and cloud, the proximity of the landmass would have been identifiable by the approaching helicopter owing to the contrast in visibility. “They would have been able to see it from a long way off and their navigation would have made them aware of their proximity to it,” says Kennedy. He points out that the official inquiries into the Chinook crash do not take into account actual weather conditions typical of the Mull of Kintyre. The crew were not overwhelmed by sudden bad weather. As we shall, they were flying deliberately and under control towards a specific point on the Mull – albeit that the point was obscured by localized mist and cloud. Instrument settings and flight plans verify their deliberate movements. Some other untoward factor must explain their final fatal moments. It is noteworthy that an RAF Sea King rescue helicopter arrived safely at the scene 45 minutes after the crash under the same conditions. This underlines that the conditions were not inordinately hazardous. Also remarkably, the testimony of the rescue helicopter crew about the landing conditions was never brought to the inquiries, at least publicly. Before addressing further the technical evidence for sabotage here, first it is important to appreciate the political context at the time of the Chinook incident and thus provide understanding of a powerful motive for why these intelligence assets could have been liquidated. When the final official inquiry by Lord Philip was published last July, Global Research speculated then on the possibility that the Chinook disaster could have been an inside job by the British authorities for important tactical reasons to bring about an end to the war in Northern Ireland . Back in the summer of 1994, the British government was conducting furtive negotiations with Irish republicans to entice them into a “peace process” and to accept a political settlement to the conflict that had ravaged Ireland and the United Kingdom for over two decades. An end to the conflict, largely on British terms, would turn out to be a major prize for Britain’s political establishment. But the problem for the British at that crucial time in 1994 was convincing the Irish republican movement to call off its formidable armed struggle. That was because two previous ceasefires brokered in the 1970s had been used by the British as an opportunity to try to defeat the IRA through covert methods, such as infiltration with informers. As a result, there was an abiding suspicion among republicans of British bad faith. Perfidious Albion were the perennial watchwords. It would therefore take a serious token from the British to assure the IRA that this time around “the war really was over”. Nearly three months after the Chinook deaths, the IRA announced what many analysts had believed would be unthinkable – its historic ceasefire on 31 August 1994, calling for a “complete cessation of armed struggle”. That move then paved the way for a political process that culminated in the Good Friday Agreement in 1998. And the United Kingdom and Ireland have seen relative peace since. The political gain for the British government from the “peace process” cannot be overstated. A costly and destabilising insurgency in its backyard has been successfully neutralized, and the six-county state of Northern Ireland still remains firmly part of the United Kingdom, under British jurisdiction, and for the foreseeable future. This has secured an ongoing de facto British sway over political and economic affairs in the whole island of Ireland. In many ways, the political process spelt a huge defeat for Irish republicanism in terms of achieving its historic aim of an independent, socialist united Ireland free from British rule. Republicans have become locked into a British-partitioned Ireland where the political framework is constitutionally limited to pursue their vision. Indeed, some traditional republicans complain that the movement under the political wing of Sinn Fein has “sold out” on its principles. Furthermore, the now 17-year-old IRA ceasefire and subsequent decommissioning of weapons means that there is little chance for the armed struggle to be resumed. So all in all, Ireland, North and South, has been safely returned to the British sphere of influence, politically, economically, culturally, in such an overarching way that it harks back to the colonial era of earlier centuries when all of the territory was seamlessly dominated by British policy. Understanding this gain for the British establishment underscores the crucial importance of having enticed the IRA into calling its ceasefire and to enter the political process – a process that was framed to thwart opposition to British presence in Ireland. What the British couldn’t achieve by military means, they managed by political means – the defeat of the Irish republican movement. In the grand scheme of things, the sacrifice of Northern Ireland’s counterinsurgency team would be a price worth paying. To recap, the official version maintains that the pilots were overwhelmed by unexpected poor visibility due to fog. Contrary to their impressive experience and training, the RAF claims that rather than slowing down and climbing at a maximum rate, or turning back out to sea, the pilots inexplicably advanced at an inappropriate rate of climb towards the highest ground in the vicinity – and this inexplicable action on their part was solely the cause of the crash. 2. The pilots had been keeping strictly on track until they made a deliberate right turn close in to the Mull. They had been referring to the navigation computer up until that right turn; they were not contravening Visual Flying Regulations, as alleged by the official inquiries. 3. Barometric and radar altimeter settings recovered from the wreckage of Chinook ZD576 were consistent with a landing on, or close pass over, the LZ at the Mull. 4. The power settings were matched at intermediate level, consistent with the helicopter coasting horizontally towards the LZ and fully under control of the crew. “They were slowing down, letting their speed ‘wash off’, not performing a climb,” says Kennedy. Note the official version claims that the pilots were attempting an accelerated climb over the Mull, which could not be the case if the power settings were matched at intermediate level. Local sources, in particular the lighthouse keeper who was familiar with helicopters landing, also said that the engine noise from the Chinook moments before the crash was steady – again indicating that the aircraft was under control at that time and not climbing. 5. The Chinook navigator had the course set that would have taken them “handrailing” up the coast of Islay/Jura – it was obviously their intention to cross back over the sea in a north westerly direction to use this safe, clear route after touching base at the Mull, not to fly over the Mull, as the official version claims. Comments Kennedy: “The most obvious scenario is that the helicopter crew were approaching that known landing spot at waypoint A on the Mull; it had a safe exit, or “wave-off” option, as there was plenty of room at the elevation of that spot for a moderate turn around the lighthouse back out to sea – it was the optimum spot to aim for, given the turning radii available to a Chinook at high speed, for a turn around the lighthouse. Kennedy’s investigations reveal one further crucial detail that has been denied or obfuscated by RAF officials and the British government in all inquiries so far into the crash. And it is this technical “smoking gun” that points up the malicious aspect of what happened on the Mull of Kintyre and how it could have been perpetrated. The avionics expert has obtained confirmation that Chinook ZD576 was equipped with a landing device known as a Covert Personnel Locator System. Officially, this is denied, but trusted RAF contacts have unofficially confirmed to him that ZD576 was fitted out with the system on that journey. “All the movements of the helicopter as it was approaching the Mull point to the fact that the crew were coming in for a landing or a near landing and that they were using a CPLS to achieve this. I predicted the use of the CPLS from their movements at the Mull. That has now been confirmed to me by RAF sources. This revelation of a CPLS onboard Chinook ZD576 is grounds enough for another inquiry to be opened,” he says. The CPLS, explains Kennedy, is a precision guidance system that is intrinsically reliable. It is often used by American and British military helicopters to pinpoint special forces who are trapped behind enemy lines. The system’s various manufacturers describe it as being used for “an all-weather approach to assault zones, landing zones and drop zones”. What makes the CPLS particularly useful is that it operates by a portable handset on the ground that sends an Ultra High Frequency radio signal to the receiver onboard the helicopter. Basically, the operator on the ground guides the helicopter to the landing zone and because the helicopter crew are following a unique signal there is little need for the pilots to have external visibility. They are relying on the ground operator to bring them safely to the LZ. Chinook crew misled by operators on the ground? Would the operators on the ground not have been in danger from the incoming Chinook? If that is the case, then senior people within the British military and political establishment made a call on the lives of those who perished. Why were 25 counterinsurgency personnel put on one helicopter? Other questions also need to be asked. Why were all 25 counterinsurgency personnel put on one helicopter? Who took that decision for this irregular security arrangement, especially when there were other aircraft available to spread the transport of the men? If the CPLS was being deployed, as Kennedy claims, then there should have been a record of this component in the flight plans, which the meticulous navigation pilot, Flt Lt Tapper, would have logged – was this record removed from the pilot’s flight plan after the event?